I truly LOVE the chipboard from Buzz and Bloom. Nothing compares to the quality of this product. And, all of the new designs are absolutely terrific. 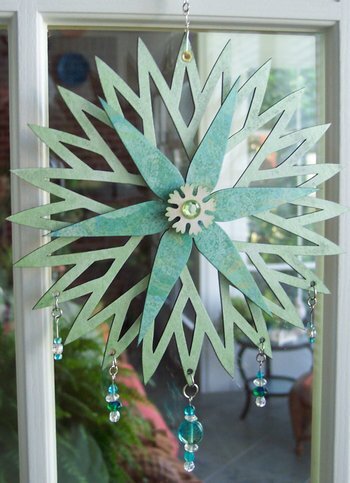 When I saw the "Spin Me Around - Spikes" chipboard, the first thing I thought of making was a light catcher for my window. 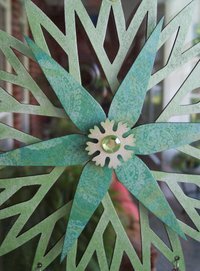 Using the large chipboard, and the inner punch out piece, I created this fun and "brilliantly" inked sun catcher. It was an easy project to make. This would make a wonderful gift too. I can already envision a red/green version to have for the Christmas holidays. I first inked up the chipboard pieces with chalk ink. I then highlighted them with several colors of Brilliance inks to give it depth and irredescence. The middle piece was also overstamped with images from the Buzz and Bloom Paisley Passion stamp set. I punched holes in the chipboard using my Crop-a-dile. This tool works perfectly with the Buzz and Bloom chipboard. I hung coordinating glass and crystal beads from the points of the design. Also, added an eyelet to the top point and wired a hook to hang the sun catcher from. 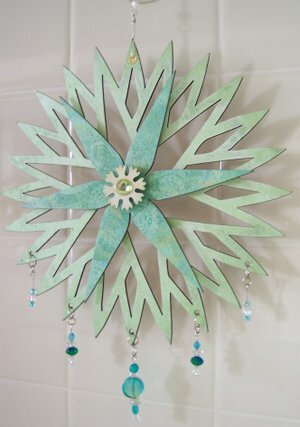 The center flower is from the Buzz and Bloom Florencia chipboard frame set. It was inked and a large rhinestone was attached. I assembled the 3 pieces together using thick 3D foam tape. Using the foam tape, really gives the pieces dimension and character. I am really happy with the way this turned out, and have it hanging in my window. It "happily" catches the light as it shines into my home. This is sooooo gorgeous! Love this! So inspiring! I really love the beads - what an elegant touch!